An advert for the annual Norfolk Churches Trust bike ride reminded me what a joy church crawling by bike can be. Swapping feet for wheels I set out under a summer sky. East of Beeston, St. Laurence I found myself meandering down quiet lanes towards St. Michael and All Angels,Barton Turf. When I got there I found an open door, a warm welcome to visitors (make yourself a cup of coffee) and a vibrant stillness. 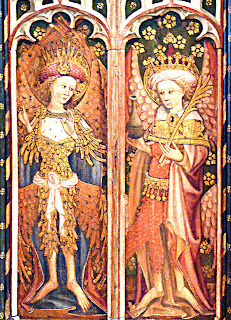 Its 15th century rood screen has St. Michael and the nine orders of angels. Wandering in the churchyard before taking my leave I saw that the local church has a care for other feathered friends too! There’s an owl box high in an old oak tree! My next church destination would be St. Michael, Irstead. But on the way , I popped into the White Horse at Neatistead for refreshments and explored the edge of Barton Broad.